Oh Fall! How I do love thee. Rainy cold nights spent with my best friends. My daughter (even after four years I still love the way that sounds) has an amazing fashion sense that she gets completely from her mother. We had our first science co-op meeting yesterday. It went really well. We kept it small this year, only three families, so that we could see if it was going to work out well and was it worth the time and cost, etc. I thought it went really great and I hope to get more interested families involved for next year. Some ideas we had about the science co-op were getting a wider age-range and splitting the group up by age. There are many things that you can do with a kindergartener that a sixth grader would find dull, and vice-versa. I'd be open to suggestions if anyone has every been involved with a science co-op and has some good ideas. I find science more difficult than other subject areas because it is so hands-on and requires a lot of prep. An activity demonstrating bone strength. Workboxes are still awesome for Margaret. Not sure where she's at in compared to her like-aged peers, but I honestly don't really care. She's four and she loves school. That's what mattes. 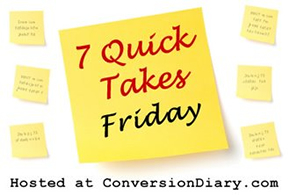 Do you enjoy my Quick Takes? Please leave a message to let me know. Sometimes I wonder who reads these. Not that I wouldn't write them if no one was reading. I like to have these for the blog book I print up each year. Music Together is a worldwide program designed expose young children, up to seven years of age, about music and movement. Based on the belief that all children are musical, Music Together can teach young children to sing in tune, keep a beat, and learn about music of their culture. Music Together classes are offered all over the United States and in many locations worldwide. For the family in which Music Together classes are not an option, Music Together offers many products that can be used in the home. The on-line store offers several musical instruments, CD sets, song collections, Teaching Guides, and Gift Certificates. They even have a 'Give the Gift of Music' section on their website that includes ideas such as: Gifts for under $12.00, and Gifts for Preschoolers. I especially loved the Lollipop Drum. I was fortunate enough to receive the Music Together Family Favorites Songbook for Teachers and the Music Together Family Favorites CD. The instructor manual can be purchased for $29.95, and the CD is $14.95. You can purchase both together and save $5.00. These products are designed for anyone who works musically with children; but you don't have to be musical to teach with these products. Those who know me well know about my painfully obvious lack of musical ability. Despite my lack of musical knowledge, we are a very musical family. We sing together, dance together, and five of the seven people in this house play at least one instrument. It was exciting to receive a musical program just for the littles. The instruction manual was very thorough and a bit overwhelming for someone with such a keen lack of musical ability. But after we started using the program I realized that all the claims on the website about young children being naturally musical are true. Using the instruction manual as a guide, I felt that the program really taught itself. Margaret dancing to the music. Malcolm is doing his usual 'stare at the CD player' while he gets a feel for the sounds. The problem I have with many children's music program is that the songs they sing and the music they play is just so... stupid. I can never understand how companies think that just because children are young, their music has to be all silly and dumb. That is not how it is with Music Together. The songs are catchy and the lyrics are good. I even found myself humming a tune when I was alone in the car. Alone. With no children in sight. Even Michael, who has very defined musical tastes, agreed that these songs offered benefit for musical growth. If you know Michael and that doesn't get you interested in this program then nothing will. You can check out some samples of the songs on the CD here. But have your credit card ready, because you'll probably need it. The lessons in the teacher book are laid out very clearly and are easy to follow. Track numbers and materials needed are right there so you don't have that panic-moment where you realize you need a bunch of things you didn't get ready. With young kids that moment often spells meltdown. I loved how the lessons were divided up into age-categories, offering different suggestions for different ages and abilities. Since a majority of homeschooling families are teaching within this dynamic, it made the program even more perfect for homeschoolers. Now Malcolm's getting into it. I love the little bopping up and down that he does as he dances. Now it's important to recognize that doing the program at home is not going to match the level and fullness of enrolling your child in a Music Together class. I am not trying to say that buying the book can completely replace the classroom experience. The classroom teachers are specifically trained for this instruction, and that is something that is impossible to duplicate at home. You can, however, give your child a wonderful experience and exposure to the course, and also give yourself a nice little self-confidence boost that lets you know that you can teach your child about music. Oh! When can that work be in my boxes again? I can do the prettiest dancing when we do my music school work. "Ah-Da!" Translation: Where is my milk bottle? As a bonus to my readers, you can enter the coupon code: SCHOOLHOUSE at check-out and save an additional $2.00 off your order. Many other members of The Schoolhouse Review Crew reviewed Music Together. You can read their reviews HERE or by clicking the banner below. Disclaimer: As a member of The Old Schoolhouse Review Crew, I received products from Music Together free of charge in exchange for an honest review on this blog. I received no other compensation. Margaret knows how to identify most of her letters, and she is working hard on letter-picture recognition. This Workbox of the Week shows some of her work regarding letter-picture recognition. This is a very easy activity to set-up, but it does require a little bit of cost. I divided a piece of paper into sections and wrote a letter at the top if each section. I then cut apart Lakeshore's Alphabet Picture Stickers and Margaret placed them in the right sections. A more cost-effective way to complete the activity would be for you to find pictures and letters in magazines and have your child glue them onto the sections. This of course would require more planning and time. A word about the stickers. I bought the pack of these stickers when James was in Kindergarten and have used them in this way with all of the kids. I still have plenty of stickers left. They are designed for classroom use and contain over 3,000 in the package. Definitely worth the initial cost. Cost: Little or none with magazines or $20.00 for the stickers. Do you ever get tired of teaching the same subjects everyday? I know at my house we get into a routine and go strong with the schooling for a while, but then the energy we once felt begins to wane and even just getting through a simple assignment seems to take forever. I often wish that we had something to look forward to each week that didn't involve leaving the house or a ton of planning on my part. Enter Homeschool Legacy's Once-A-Week Unit Study! Specially designed for the busy homeschool mom or dad, Once-A-Week Unit Studies focus on learning about God's amazing creations while instilling a love of learning in your child. The units are set up so all the teacher needs to do is make a quick trip to the library and you are ready to dive right in! The idea behind these unit studies is that families drop their regular curriculum for one day each week to focus on the unit study curriculum. The unit study contains all the subjects normally associated with a homeschoolers day including: math, writing, science, art, and field trips! I was excited to receive a copy of Weather on the Move. It contained seven weekly lesson plans and many activities, assignments, and suggestions for further study. Some of the activities we completed included: weather tracking charts, hurricane tracking charts, weather journal, making a rain gauge, learning about clouds, and creating a terrarium. 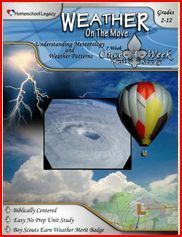 Designed for grades 2 to 12, Weather on the Move retails for $19.95 on the Homeschool Legacy website. I am sure that you are wondering how I could abandon our regular studies for one day a week in favor of this unit study. The answer is that I didn't. My boys still completed their regular assignments for all of their 5-day a week curriculum subjects. This included math, spelling, English/grammar, and writing. These few subjects were finished early and we devoted the rest of our school time to the unit study. Family read-a-louds we completed during the week before night-time prayers. In my opinion it wouldn't be a true homeschool curriculum if you couldn't tweek it easily to make it fit with your family. Weather on the Move was definitely easy to fit into our schedule on our terms. Additional items were needed to complete the extra activities within each unit. The course comes with the lesson plans and additional reproducible items, but not materials for the experiments. I found that almost all the items required were common household items and didn't require a separate trip to the store. Perfect for the homeschool family on a budget! I loved how the program used books that were easily found at my local library. It's not often that a science-based program can be completed so easily and with so little cost. We didn't get to complete any of the field trips, although many of them looked great. It is just too hard for me to take all five kids without Michael along to help. We will definitely revisit the field trip listings when Michael is on a school break. I thought it was fun because I like learning about weather. I had a hurricane named after me this year! I thought the weather work was fun and I liked how we all got to do it together and it wasn't just one of us doing our separate work. I liked the weather chart. I like how we can see weather... not like volcanoes or... hot air balloons. Homeschool Legacy offers many different Once-A-Week Unit Studies subjects including: Birds, Trees, Knights, and Horses. My fellow crew members at The Old Schoolhouse Review Crew have reviewed the weather unit and nine other subject areas. Click here to read their reviews or click the banner below. Disclaimer: As a member of The Old Schoolhouse Review Crew, I received Weather on the Move free of charge in exchange for an honest review on this blog. I received no other compensation. Do you ever cruise Craigslist for furniture? If you do, then maybe you have experienced where you open up a link to what you are looking for, say a small sofa in your area, and when the picture pops up you do a double take and ask yourself "What the heck? Who buys that?!?!" Maybe like us, such people were "gifted" with said furniture and are now trying to make a buck off your lack of good taste. It's that time of year again to join The Old Schoolhouse Review Crew. So if you are a homeschooling blogger and want to receive tons of free curriculum stuff to review on your blog, send me an email and I will get you the application info. I've been on it for three years and hope to get selected again. Of course if I don't get selected and you do, then we can't be friends anymore. No pressure. Just saying. I almost skipped Quick Takes this week, but then I saw that Cari completed hers hours before I even woke up and it motivated me to write at least three. "Oh. I got it wrong. What is that? Like an F-minus?" Gotta love Life of Fred Math. Michael is taking James to a Boy Scout camping thing this weekend which means that I will home without my two biggest helpers. Which means I will leave the house only to go next door for Dominos pizza on Saturday night. My other neighbor, not the pizza eating one, saw this facebook picture and wrote an awesome blog post on accepting other mothers as is. She's a real sweetie and you should check out her post. Click here to read it. I am continously surprising myself by how easy it is to fill these workboxes! Margaret struggles a bit with number value. So I wrote numerals and number words on index cards and she get to paste jewels or stickers on them. She really enjoys this activity and completes it several times a week. Having stickers that she likes seems to be a key to getting her excited again and again about this activity. So far she has had the Disney stickers that came in the mail, Tinkerbell stickers, and the foil star stickers. Fun Factor: 5 out of 5 for my girl. I am working my way through the alphabet with Marcy over at Ben and Me. You can check out my previous posts on Blogging through the Alphabet by clicking here. One area that I struggle to be a good teacher is in handwriting. My children have readable handwriting, but that is really all you can say about it. Readable. In a world where technology is starting to take over all aspects of life, having good handwriting is becoming a lost art. This sloppy mess belongs to a fifth grade-aged sixth grader. This is a beginning second grader who is still six years old. They have the letters down and can write and it is readable. But it is not pretty. Or neat. So I thought I would teach cursive and hope their writing improves. At first I was using Handwriting Without Tears for cursive because let's face it. That program is cheap. And when I need to buy three of everything, price matters. But after three years of HWT cursive for James, I just didn't really see any improvement. He doesn't like cursive because it takes too long. And I myself wasn't taking enough time to appreciate handwriting as it's own subject. We were just getting it done to cross it off. Another sloppy mess. I guess being a doctor may be in his future. What do you use for cursive? James' team lost this week, but they are so much better than last year. It is incredible what a summer can do for a bunch of ten year-old soccer players. Margaret still loves her workboxes. I just can't get over what a help this system has been to our homeschooling day! 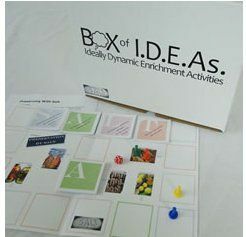 This week the workboxes had items for the letters A to D, art, and basic math. Ballerina and Bear finger puppets. Stringing homemade beads that she painted. I got this idea over at Ben & Me. I printed up these really neat alphabet cards from Making Learning Fun. They are designed to be used with the pattern blocks. There are both capital and lower-case. She dressed her magnetic dolls in dresses. This workbox was my favorite this week. I got a bunch of photos for free from Shutterfly and I ordered two of each and laminated them. I put about ten different photos in the workbox and let her find their match. It is a great way for her to see photos of family who live far away, which for us is everyone. She also really enjoyed seeing how much her and the Brothers have changed over the years. That's it for this week! 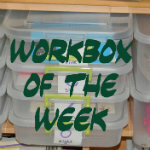 Click here to check out my other Workbox posts.